No longer are teachers seen as know-it-alls. The enhanced lecture and the pause procedure show that students can teach each other just as well, if not better, than teachers can. Of course nowadays the move it shifting towards active teaching, which takes Dale's Cone into consideration. 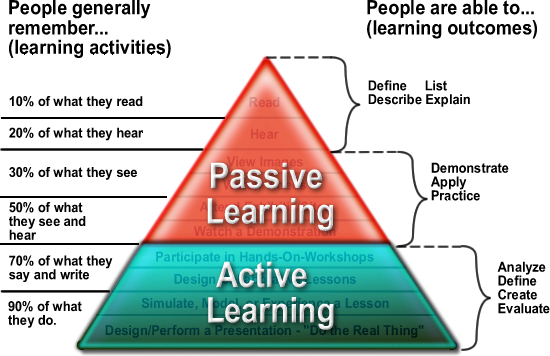 There are times when passive teaching does have its place, but try to use active teaching in your class as well. Passive teaching assumes students . . . 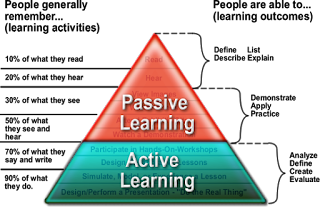 Passive teaching assumes teachers . . . Active teaching assumes students . . . Active teaching assumes teachers . . .